The Nikon D750 Digital SLR Camera improves on the D700 with an extra boost in ISO (from 100-25600 to 50-51200, extended modes) and an increase in shooting speed (from 5 to 6.5 FPS). It is also sports a larger, tilting LCD screen and double the megapixel count. The D750 differentiates itself from other full frame Nikon bodies, like the D800, by having built-in WiFi and the ability to record uncompressed 4:2:2 8-bit footage to an optional external recorder, such as the ATOMOS Ninja 2 Video Recorder. Zebra stripe highlighting can be applied to aid in controlling overexposure during recording, too, along with in-camera Picture Control profiles, custom tone curves, and a flat profile to benefit color grading applications. Take advantage of Nikon's native Creative Lighting System by firing off-camera flashes, such as the Nikon SB-910 Speedlight , with your built-in flash and control external flash power directly from the camera's menu. The D750 also supports in-camera time-lapse shooting with automated exposure smoothing. Though the D750 is a full frame, or FX, format camera, it will automatically switch to and support the use of DX-dedicated lenses when attached. 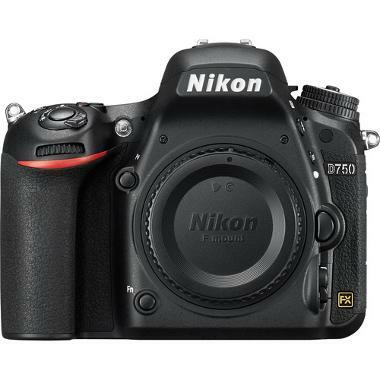 The D750 is a powerful and versatile camera for videographers and still shooters alike. • This camera is compatible with Lexar and SanDisk brand memory cards. Use other brands at your own risk. • Full frame and crop frame format F mount lenses are compatible with this camera when using the appropriate crop mode (crop format is automatically deployed when DX lenses are detected).